Police have threatened to expose soccer ‘fans’ who were involved in a post match fracas after a Portadown FC match in Newry at the weekend. 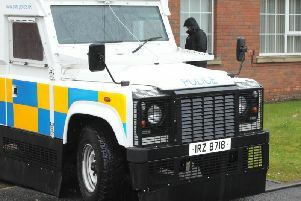 PSNI Craigavon said they will use CCTV footage and post images of suspects involved in violence. In a forthright Facebook statement they asked anyone who was involved to hand themselves into police or risk being publicly exposed to their family, employer, school or college. The police said they have already received some footage and once it is assessed they won’t be ‘hanging about’. Footage of the clash which has appeared on some social media sites showed a number of men fighting with a steward trying to break them up. Thugs were seen using weapons to attack fans with at least two people requiring treatment for injuries. Several cars were also damaged. The PSNI in Craigavon said: “We take pride in our district and all the many positive things that come out of the community. In recent times, sport has been at the forefront of local success and something we can all be really proud of. “That makes this appeal all the more angering to have to make. “So with that said, are you one of the “fans” who let Portadown FC down monumentally at the weekend? On Friday night, trouble broke out after a match as Portadown visited AFC Newry in The Championship. It is both infuriating and embarrassing when another district gives us the heads up that a minority of “fans” have let the respectful majority, down. There were injuries on Friday night as people fell from stands and cars. “Our colleagues in Newry are investigating but we will give them every bit of help they need as, we trust, you will too. “If you follow the page you’ll know about Op Exposure, where CCTV and video footage is released publicly to identify suspects. We have already received some footage from Friday and believe more may be available to us very soon. Once footage has been assessed, we won’t hang about. Your family will see it, your employer or school/ college...in short, there’s no hiding place. “If you know any of those involved in the violence, or you yourself were, NOW is the time to call us. If you’ve seen yourself on footage, we will too. What you won’t have seen is the footage from within the ground, the close up photos, enough to make your ma bury her head in her hands when she sees what you’ve been at. “If you were fighting, throwing bottles, on the roof of the portacabin, on cars, on otherwise behaving in a manner you wouldn’t want to be made public, your best move now is to phone us on 101. If you get us soon enough, you’ll avoid your image going public to identify you. Currently the only hold up is matching up phone footage with crystal clear stills we have from inside the ground. Once we have that done, you’re on borrowed time. “The statement from Portadown FC last night says it all. That sort of behaviour has NO place in society, does not represent the club in anyway, and is a disgrace to the individuals engaging in it and those who would hide them.